Laurette expresses themes of freedom and victory over mental combat. 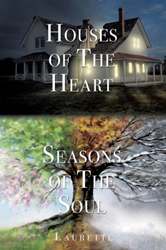 Within the pages of Laurette’s new book, Houses of the Heart, Seasons of the Soul, ($13.49, paperback, 9781545615171; $6.99, e-book, 9781545616529) readers will immerse themselves in a poetic journey. Author Laurette offers reinvigorating words and imagery to soothe weary souls trapped in spiritual warfare amongst the tech-heavy society we live in. Laurette has been a member of a multi-disciplinary team in the provincial psychiatric Intensive Care Unit for over a decade and is also an ordained minister and radio broadcaster. Her previous work includes Feed My Sheep Discipleship Training Manual and Feed My Sheep Leader's Guide. Xulon Press, a division of Salem Media Group, is the world’s largest Christian self-publisher, with more than 12,000 titles published to date. Retailers may order Houses of the Heart, Seasons of the Soul through Ingram Book Company and/or Spring Arbor Book Distributors. The book is available online through xulonpress.com/bookstore, amazon.com, and barnesandnoble.com.